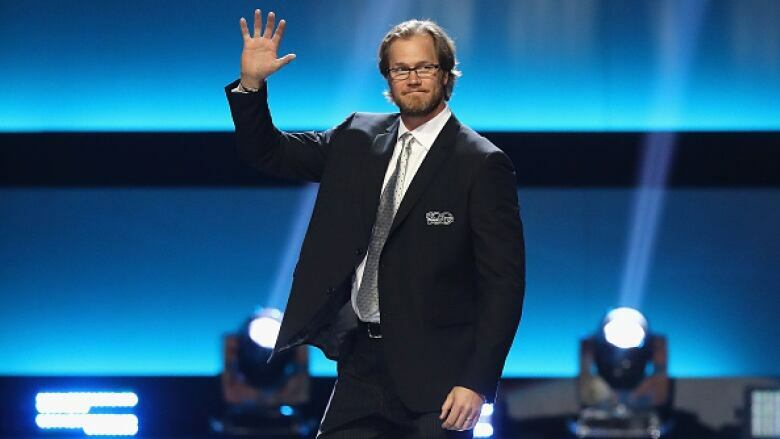 Former NHL MVP Chris Pronger has joined the Florida Panthers' front office as a senior adviser to team president Dale Tallon. Former NHL MVP Chris Pronger eventually wants to be a general manager, and Florida Panthers GM Dale Tallon saw that as opportunity. The Panthers added Pronger to their front-office staff, announcing Thursday they've given him the title of senior adviser to the president of hockey operations. In simpler terms, he'll be Tallon's understudy of sorts and a part of the brain trust in Florida as the Panthers try to get back to the postseason. "I like to hire smarter people than myself, to make myself look smarter," said Tallon, who is also the Panthers' hockey operations president. "I've gotten to know him for the last four or five years. He's got a lot to say. He doesn't sugarcoat it. I like his approach. I like his knowledge. He's opinionated and we like a staff that has that in them." Pronger technically was an active player until this past season ended, even though his last NHL appearance was Nov. 19, 2011. He was sidelined because of post-concussion symptoms and other issues caused from taking a stick to the right eye. When he got hurt, Pronger was the Flyers' captain in the second year of a seven-year, $34.5 million US deal. His contract was traded by Philadelphia to Arizona in 2015, but Pronger never could return to the ice. He's spent the past three years in the NHL's department of player safety, and often spoke of wanting to pursue a GM role somewhere in the league. "I'm excited to have the opportunity to work with and learn from an executive with the track record that Dale has," Pronger said. "I'm looking forward to doing everything I can to help the Panthers work towards winning the Stanley Cup." Pronger won both the MVP and Norris Trophy, presented to the top defenceman in the league, for the 1999-2000 season. He helped Canada win two gold medals in his four Olympic appearances, won a Stanley Cup with Anaheim and appeared in 1,167 regular-season games with five clubs. He finished his playing career with 157 goals and 541 assists, is one of only two defensemen since World War II to be an MVP — Bobby Orr is the other. Tallon said Pronger would work with another former defenceman in the Panthers' front office, director of player development Bryan McCabe. "They're current guys, they're modern guys, they know what they're talking about," Tallon said. "It's all part of helping us get to our destination of winning multiple Cups."